what do you mean my new door handle won’t work?! So you have an old door that you want to keep, but you hate that old hardware. You browse the internet and find the perfect lockset. It is your style, your finish and you happily order it. It comes in the mail and you decide you’ll tackle the 15 min exercise of switching out the hardware to see how it looks. That’s when you notice; the hole(s) left by your old lockset are very different than what is required for you new lockset and it won’t work. There is a huge void in your door where the old lockset was and the new latch mechanism has nothing to sit in. 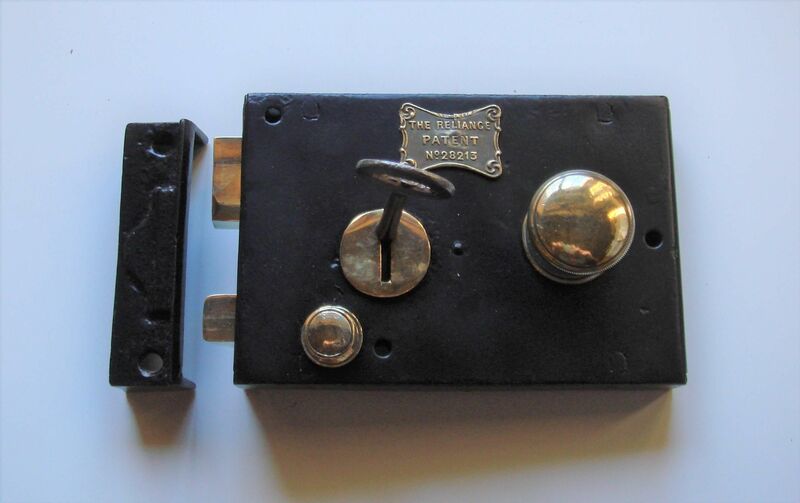 Most likely, your old door had a mortise lockset and the new one you just fell in love with is a cylinder lockset. Fear not, I am dealing with the same issue and we can make it work together. These dominate the market, especially the residential market. There are a fair number of commercial building owners switching to these as well due to the easier maintenance and repair. A majority of the locksets you will see in your lifetime are cylinder, and this is probably what your new fancy lockset is. The space for the lockset is created by drilling a large hole from the face of the door and then a smaller hole for the latch from the jamb of the door. These are extremely easy to install, you can even find guides that clamp onto the door and make it nice and easy. These are still used regularly in commercial applications, but are rarely ever used in residential applications any more. You will find them; however, in older homes. With this type, an actual mortise has to be created, like a pocket, for the lockset. This can be done a number of ways, but is usually done by drilling a series of holes from the jamb and then using a chisel to square up the hole. These are bit harder to install and can require a professional. 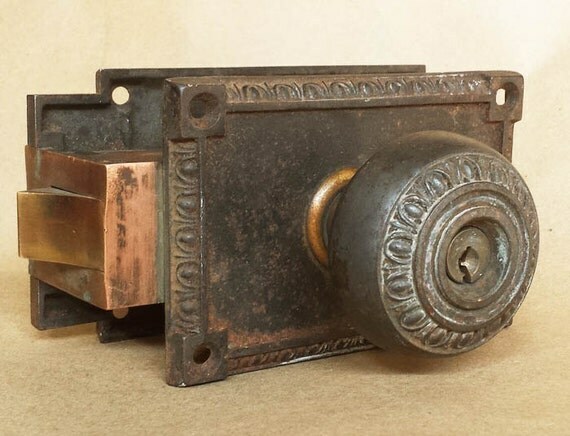 This is one of oldest styles of locks and is rarely used any more. Really only used if a certain historic period or aesthetic is trying to be achieved. Can also be used if for some reason modification of the door is not an option. This type requires the least amount of modification to the door, essentially none. The entire lockset is face mounted to one side of the door (interior side on exterior doors). Meaning you can only lock and unlock from one side. There are versions that have a knob on the other side, but if you can drill a hole through the door why would you use a rim lockset? Unit locksets are rarely used, but can be an option for commercial projects. These locksets are generally expensive and very robust. As the name suggests, they are a single unit from the factory, no assembly required and can handle a lot of traffic. They are also very fast to install. Modification to the door requires a single notch through the door from the jamb. The unit slides in from the jamb side and then is either clamped in place or screwed to the face of the door. You cannot remove the lockset unless the door is open. Remove the existing mortise lockset. This should be fairly straight forward. Remove any jamb face plate and remove any screws that are attaching the body to the jamb of the door. There is usually a set screw on the interior side knob that you can loosen and remove the knob. Once the interior side knob is removed, you should be able to pull on the other knob and remove the entire spindle. Remove any trim plates on either side of the door. At this point the entire lock case body should slide out of the jamb of the door. If it doesn’t want to budge, sometimes you can pry on it with a screwdrive through the spindle hole to help push it out. Before we can move forward, we need to fill the mortise in order to support the new cylinder and latch. There is more than one way to skin the cat here, but you just need a snug fit with a piece of wood. The exposed face on the jamb of the door should be as tight as possible to look the best and require the least amount of wood filler. I recommend using poplar or pine. Both of these are relatively cheap woods and if you do other projects around the house, you probably have scrap of one or both lying around. Poplar is nice though because it is a popular hobby wood; meaning you can find it in smaller dimensions that will require a small amount of modification to fit snuggly. It is also a hardwood and is more stable than pine; makes a great wood for painting. I used what I had lying around so I ended up using a piece of 1x pine. You can choose to either make the filler piece fit the mortise, or make the mortise fit the filler piece. I chose to make the mortise fit the filler piece and cleaned it out some more with a chisel, just be careful not to take too much material. Once you get the piece to fit, and cut the length, lather it up with wood glue and hammer it in with a rubber or sand filled mallet until it is flush with the jamb of the door. I used a claw hammer and dented the crap out of it. Wood filler fixed this, but I’d recommend using a mallet. If you’re worried about it moving, you can secure it with a few brad nails from a nail gun, just avoid nailing where you need to drill the holes. Mine was very snug so I did not use any nails. Allow the glue to dry for at least 24 hours. I will start by saying using actual wood pieces to fill large gaps or holes is always better. But who has the time, tools or patience for that (I did end up using some small pieces in the jamb recess on either side of the mortise which worked out well). The key with wood filler is to build it up in 1/16″ or so layers. Its very easy to try and do too much at once with this stuff and I am totally guilty of this. It can turn out okay in the end, but the results are always better if you build it up in layers. Use wood filler to fill any holes in the face of the door that won’t be covered by the new lockset and fill the recess in the jamb of the door. Don’t worry about hole for the knob in the face of the door, this will get removed anyway (you’ll notice from the picture that I didn’t think about this). After the wood filler has had ample time to cure with your multiple layers, sand the jamb and all the holes flush with the surrounding door. You can start with a low grit like 80, but I recommend finishing with 220. A belt sander would make flushing the jamb up very nice, but I did it with a random orbit sander. This step can vary some depending on your lockset, but most cylinder locksets are pretty much the same prep. You can buy door prep kits that come with the hole saw bits you need as well as a guide to help you align the hole locations. Drill the hole for the lockset through the face of the door from both sides. It is recommended to do it from both sides, don’t drill from one side all the way through. If you go all the way through from one side, you risk tear out on the back side. Drill the hole for the strike in the jamb of the door. Then, if you want a recessed strike trim (typical), you will have to chisel out a portion of the jamb to account for this. That’s it, you’re done! Follow the instructions that came with your lockset to install your lockset in your newly prepped door. There may be some modification required to the door frame jamb for the strike plate, but I won’t go into that in this post.